Do you feel that you could be achieving more than you are now? Are negative reactions preventing you from experiencing joy? NLP Practitioner Certification Training focuses on the practical application of advanced communication and behavioural skills to move you to the next level of your personal and professional development. Taught by international speaker and NLP Master Trainer, Lynn Robinson, the NLP Practitioner Certification Training course is a results oriented program. Learn how to release anxiety, change your limiting beliefs and stop letting people push your buttons so that you can transform your relationships, advance in your career or business and create your desired self-image. “I took the NLP Practitioner Certification Training in January 2018 with Lynn Robinson. My experience exceeded my expectations; Lynn is a fabulous teacher with great energy who truly wants to support you in the learning process. With Lynn’s teaching style, hands on practice, stories to relate to our learnings and being amongst a like-minded group of people made the learning fun. NLP not only enhanced my life, it has helped me understand how to better serve my clients and help them uncover and release their limiting beliefs to reach their full potential. I now observe, communicate and listen differently in my daily interactions with people. “I highly recommend if you are struggling with a pattern that produces an undesirable outcome, and you want to improve your communication skills and relationships then this is a program for you. 1) TimeLine Techniques (TM). This is the most powerful tool available to assist people in eliminating negative emotional responses to life’s challenges, and is included in the training. 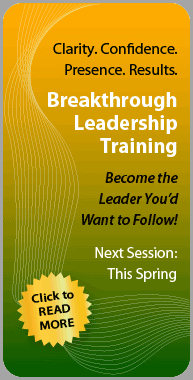 2) Breakthrough Leadership Program Certification. This is The Robinson Group’s signature Leadership Training program. Copyright ©2013 The Robinson Group Inc.